After a flawless performance of Giselle this past week, we've become a little obsessed with Sarah Lane. The American Ballet Theatre soloist seamlessly performed the crisp jumps and airy dancing that matched Giselle's youthful approach to love. Then transitioned into more fluid arm movements and lengthened lines that went along with her heartbreak (after an impressive mad scene at the end of Act I) as a Wili. Fluffy snow yaks, dancing cupcakes and a slithering candy-cane worm. These, along with many more candy confections (and a creepy doctor with a massive head), make up the cast of characters in Alexei Ratmansky's new full-length Whipped Cream at American Ballet Theatre. The company, which performed the world premiere in California in March, is gearing up for the New York debut on May 22. Needless to say, there's been lots of anticipation over pop-surrealist Mark Ryden's fantastical costume and set designs. Photo by Bill Cooper, Courtesy of the Royal Opera House. Are you a dancer between the ages of 15 and 18, or in high school grades 10–12? Are you interested in receiving scholarships (up to $10,000), working with mentors like Mikhail Baryshnikov and having a chance to be named a U.S. Presidential Scholar in the Arts? Then the National YoungArts Foundation wants to hear from you. Now through October 13, 2017, the nonprofit organization is accepting applications for students interested in becoming a 2018 YoungArts winner. And just in case you're wondering, past participants include American Ballet Theatre's Sarah Lane, The Royal Ballet's Sarah Lamb and English National Ballet's Precious Adams—so it's a pretty big deal. It's Youth America Grand Prix time again, and when the competition wraps up this week, we'll meet some of tomorrow's potential stars. YAGP has a track record of predicting some of ballet's biggest names. Take a walk down memory lane with us and see for yourself. It's that time of year again: Applications to become a 2017 YoungArts Winner are now open. Every year, the National YoungArts Foundation offers awards to promising high school-aged artists in the visual, literary, design and performing arts—and those awards come with some seriously exciting opportunities. Winners have the chance to earn cash prizes and scholarships, work with mentors like Mikhail Baryshnikov and Jacques d'Amboise, and perform at top venues like the Kennedy Center in Washington, DC, and the New World Center in Miami. In January, finalists are invited to participate in National YoungArts Week in Miami, seven days of master classes, workshops and performances. You could also be nominated to be a U.S. Presidential Scholar in the Arts—one of the highest honors a high school senior can receive. Possibly the best part? Winners join a network of over 20,000 YoungArts alumni, which includes dancers like American Ballet Theatre's Sarah Lane, Miami City Ballet's Callie Manning and Complexions Contemporary Ballet's Desmond Richardson. To be eligible, you must be between the ages of 15 and 18, or in grades 10–12 (as of December 1, 2016), and you must be a U.S. citizen or permanent resident. Applications opened this month, and you have until October 14, 2016 to apply. So, what are you waiting for? American Ballet Theatre Stars on Jeopardy! American Ballet Theatre Principals James Whiteside and Gillian Murphy on the set. Photo courtesy of Jeopardy! On Tuesday, November 17, for the second time, contestants on Jeopardy! will take a stab at ballet trivia with the help of dancers from American Ballet Theatre—another event to celebrate the company's 75th anniversary season. Look out for principals Gillian Murphy and Cory Stearns and corps member Blaine Hoven, who will read clues and give demonstrations of ABT's repertoire. 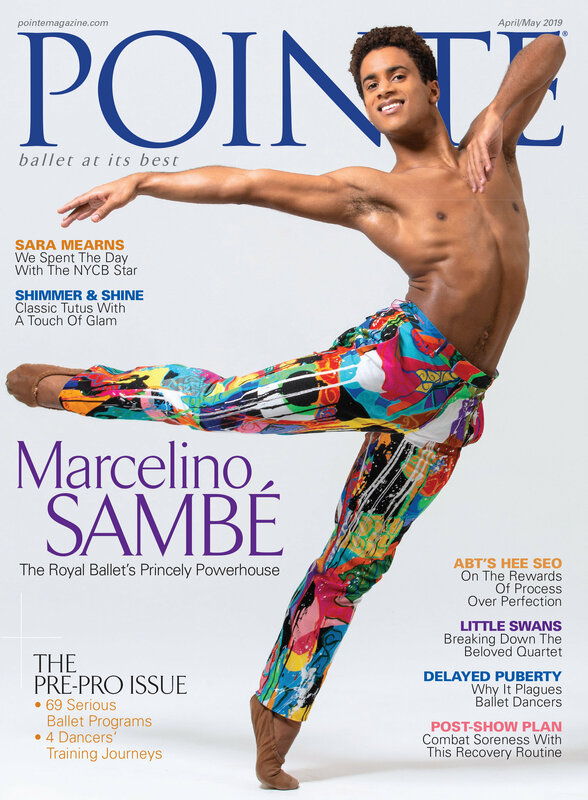 The first episode (which aired last May) featured James Whiteside, Craig Salstein, and Pointe cover girls Hee Seo, Sarah Lane and Misty Copeland. Boylston, Seo and Lane in costume for ABT's new production of The Sleeping Beauty. "Photo by Nathan Sayers for Pointe. This is Pointe's June/July 2015 Cover Story. You can subscribe to the magazine here, or click here to purchase this issue. Ascending the ranks to "ballerina" status at American Ballet Theatre comprises the stuff of dreams for many dancers. Since its inception in 2003, ABT's Jacqueline Kennedy Onassis School has been steadily molding students who graduate into the company. But within the last two decades, only several women have successfully journeyed from the ABT Studio Company to star. Three ballerinas emblematic of that distinction take a particular pride in being homegrown: Hee Seo, Isabella Boylston and soloist Sarah Lane. Along the way, they have reaped sublime rewards, peppered with self-doubt, will power, patience, corps de ballet fatigue and a firm focus on their goals. While ABT regularly imports international guest stars for its spring Met season—a source of frustration for some dancers—Seo, Boylston and Lane have carved out a place for themselves in the company and in the hearts of their audience. Alexei Ratmansky, ABT's artist in residence, has championed their talents; all three will dance Aurora in his acclaimed new production of The Sleeping Beauty in June. And with the retirement this season of three ballerinas crucial to ABT's identity—Julie Kent, Paloma Herrera and Xiomara Reyes—these younger dancers now take center stage, becoming role models for the next generation.